In the vein of the included normal mansions, Jack has happened upon Bobcat Mansion. Bobcat Mansion Normal is larger and every room has some changes from the Easy version. Can Jack find all of the gold and secrets while avoiding medusa's, spiders and electrical bolts? This has been thoroughly beta-tested. My 1st time trying I got 40+ secrets. 2nd time around, Jack found his way around much better, but only 70+ secrets. We were positive that we covered everything. The balance of the secrets must be well hidden. ....to power up my comp. 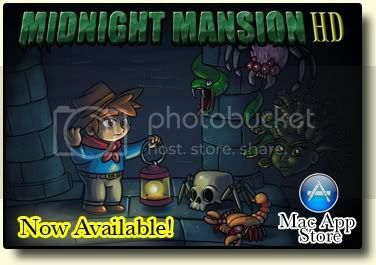 while on vacation, with a bit time to spare, hop over to these pages and find a new mansion !! Downloaded it immediately and had me a bit of fun.....! It's a solid mansion in the traditional vein, which offered a few nice twists. Although I saw a few smaller (mostly design-related) issues, there's nothing serious and it's runnin' smoothly. (I played the normal version, BTW). I ended with 100 % secrets and saw no more closed doors on the map, but I still had 2 or 3 keys left (most of which were blue, as far as I recall). What did I oversee ? Glad you enjoyed it Aquamat. Thanks to Brell's solution, MM players got Christmas gifts of new mansions. I'll look into this and see what you missed or if I did something during the beta-test changes. I'll let you know either way. Well Aquamat. I sacrificed some time and replayed through the mansion and even looked in the builder. If you had keys left over, you must have missed the doors somewhere. I know one of the blue keys is easy to do that with because you pass over the blue door then have to return to the room on a different floor. Sorry I don't have more help for you. Maybe you missed a room? Guess I must have missed something then....even an entire room....as far as I see it, this was easily possible, given the zig-zag nature of the exploration that I was forced to take (which was something I really liked about that mansion BTW). I will simply replay it from scratch and see if I'll get it right this time. Really enjoyed this mansion, but only just discovered it as it is not on the list of 'Mansions Sorted By Date'. (I usually check for new mansions from the quick link at the top of the home page.) Maybe someone could move Bobcat Normal and Easy there so other people don't miss out too! It will be moved eventually. Glad you liked it AussieChick.